Chasing 464 for a morale-boosting win, India’s top order collapsed once again to England’s on-song opening attack. A dazzling display of batting and bowling by England crushed India by an innings and 159 runs in the second Test at Lord’s. 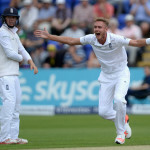 In the recent Test series against New Zealand, Stuart Broad became the second English bowler to pass 400 Test wickets. 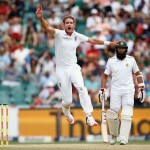 Stuart Broad has been selected in England’s Test squad for their first Test against the Proteas on 6 July. Stuart Broad has picked up a heel injury which could rule him out of the Test series against South Africa starting 6 July. 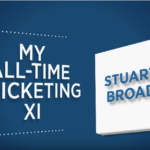 England Bowler, Stuart Broad, picked Jacques Kallis in his Proteas-deprived all-time XI. England all-rounder Stuart Broad has spoken out against match-fixers being allowed back to play cricket. 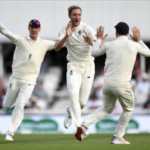 English quick Stuart Broad has warned his team’s batsmen of the threat posed by the Pakistan bowlers ahead of the teams’ Test series. England selectors have brought back the dynamic Ben Stokes into the ODI and T20 formats for the series against the Proteas early next year… and there is no place for Stuart Broad. England fast bowler Stuart Broad has compared Dale Steyn to one of the greatest footballers of all time. 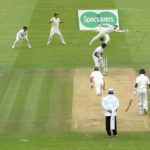 An Ashes Test cannot be won in a session; but they can probably be won in three: After Stuart Broad’s incredible performance in dismissing Australia for 60 on the first morning of the fourth Ashes Test, England consolidated at 274-4 at the close.